As I mentioned in my last post about the things I understand better about myself now that I know my energy type, I am a major procrastinator. Since there are still plenty of tasks that I need to do whether or not I really want to or feel ready to do them, I needed to find a way to help myself to accomplish the things I needed to. And since procrastinating can often make me feel more stressed since I know I have all of these uncompleted tasks looming on my to-do list, I wanted to find a way to help to reduce that source of stress as much as possible. 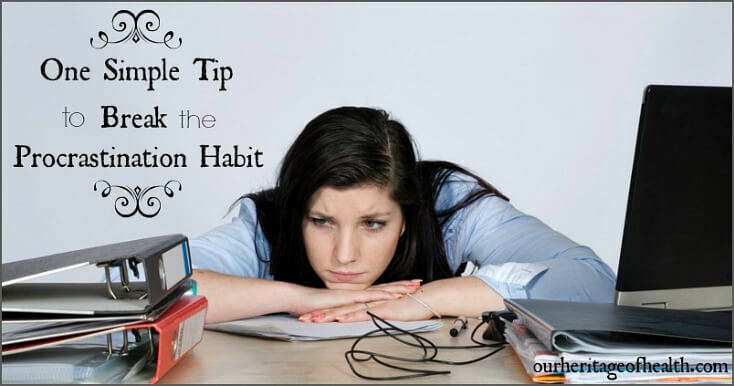 My number one tip for helping to break the procrastination habit is a very simple one. It’s not an instant cure, and I definitely still find myself procrastinating at times, but this is the one thing that’s really been helping me get more things done and to cross more tasks off of my to-do list. My simple tip is the Ten Minute Rule. The Ten Minute Rule means that I have to set my timer and spend a full ten minutes on whatever task I’ve been procrastinating doing. And that’s it. I don’t have to actually finish the task, and I don’t even have to accomplish a specific part of the task. I just have to work on some aspect of it for ten minutes. When I have a task on my to-do list that I’m not looking forward to, especially if it’s a difficult or time-consuming task, it can make me feel overwhelmed. With the Ten-Minute Rule, though, I know that I only have to spend ten minutes working on the task, and since ten minutes is such a short amount of time, it seems a lot more manageable. In addition to being a procrastinator, I’m also a perfectionist. These two tendencies really go together because a lot of times I procrastinate because I feel like I won’t be able to do a good enough job at the task, so I’ll put it off until a time when I think I’ll be able to do it better. By only requiring myself to work on something for ten minutes, though, I know that I don’t have to actually finish the whole task, which means that I don’t have to get everything done perfectly today. I just have to work for ten minutes, and then I can focus on improving the details another time. I always feel better when I can check something off of my to-do list. Sometimes I even write down tasks I’ve already completed just so I can have the satisfaction of checking them off. Using the Ten-Minute Rule allows me to at least get something done of the task I need to do, even if it’s only a small part of it. Something is better than nothing, and it makes me feel less stressed if I know that I’ve at least started the task. And nine times out of ten, once I actually start working on something for ten minutes, I usually get involved with what I’m doing and I get motivated to work on it for longer, or sometimes even to finish the entire task. 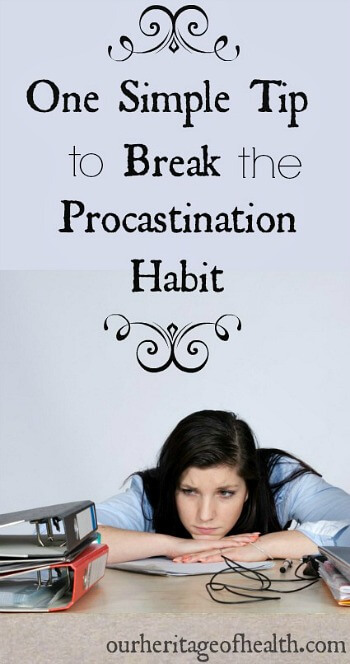 Want to Learn More About How to Stop Procrastinating? 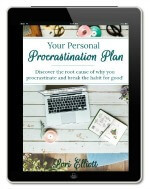 If you want to learn more about how to break your procrastination habit, my new book, “Your Personal Procrastination Plan” can help you to discover the root cause of why you procrastinate in the first place so you can break the habit for good! I could have written this about myself, youu are so right on about everything you said. I’m going to try your method. How has it been working for you so far? It’s been working pretty well! 🙂 (As long as I don’t procrastinate on the ten minute rule too, that is . . .) I’ve found myself being quite a bit more productive than I used to be, and I feel like I have less unfinished tasks hanging over my head. I have expanded on this habit. I use my timer a lot now. 20 minutes on, 20 minutes off. I do a chore for 20 minutes, then I can do whatever I want for 20 minutes. Then back to the chore. I am easily distracted so if I need to have a productive day, this is a very helpful routine. That sounds like a great way to do it! I save up all the articles I find from your blog on Pinterest and read them as I get a moment to. It’s planned procastination…. lol 😉 This was very helpful to me. I homeschool my five children, and while most of my day is planned and busy, I absolutely procrastinate. I love a plan but too much structure has less flow and makes me feel too ridgid and confined. And sometimes a too do list on top of everything else has me running for the hills (or my bathroom as a place of closer solitude…haha), so this ten minute thing is very attractive to me. It is not too long to where I would get weary of it, but not too short to whre nothing would be accomplished. I do find that as I get started on something, that perfectionist bit in me takes over and I wonder why I ever procrastinated to begin with!! lol Wonderful article as usual Lori!! Thank you, Michelle! Reading your comment just made my day! 🙂 I’m so glad it was a helpful post. Procrastination is so hard to overcome, but like you said, once you get started you always wonder why you did it so much in the first place! thanks soooo much! i never thought about this in that way! you’re absolutly right and it was like an answer from heaven for me. so easy – so good! 🙂 the right post at the right time! thank you very much for sharing this idea. I will put it in practice, for sure! I experience the same as you: either I do not know what I have to do; or I think it would not be perfect; or I do not feel like doing it – but normally, what is procrastinated is something we must do (otherwise we could simple forget it, right?). So, better face it, and the soonest! In Spanish we say “out the tooth, out the pain”. We don’t really need to be perfect. The work shouldn’t be crappy, but when we are so afraid of being judged that we never put anything out there, that’s not good. We will always have some complainers. Just do it!!! But I never thought about attacking tasks that I was procrastinating on head on first and prioritize them. I tried this today and got so much done already! thank you! Just signed up for your email list. And often times, you’ll end up continuing to do the task because you realize it’s not that bad. Great idea! Thank you; I’m really going to try that ten minute rule. I’m an artist and a silver smith who also makes my own cabochons from pieces i slice off slabs of semi-precious rock. I KNOW I have chores and things that really need doing around my house but I start on something and lose track of time or just tell myself, I’ll do this (household chore) later. It never gets done. My husband’s been dead for years & I have the house to myself. When it’s late at night & nothing has been done in the house I feel crummy & say I’ll do it in the morning & then I get side tracked again. The only time I clean like mad is before my kids come to dinner (twice a month) I really hope this works with the timer. Yes, it’s very easy to lose track of time doing the things we enjoy, isn’t it? And then the things that actually need to be done just don’t end up happening. It always feels so much better to accomplish something, but it’s the getting started part that seems to be the hardest. I hope this works well for you! I hadn’t thought of this for kids, but that would be a good idea! I still get nothing accomplished which makes me feel guilty and sad. Setting a timer only makes me feel like a failure. I was hoping for something inspirational. I’m sorry the timer method didn’t work for you and that you’re still not getting the things accomplished that you want to. Setting a timer is a method that works well for me, but everyone is different and what works for me might not work for everyone. Maybe instead of using a timer, you can do some exploring into the root causes for why it is that you procrastinate and why you feel guilty and like a failure when you don’t accomplish what you wanted to. Getting curious about what emotions you’re feeling before and after you find yourself procrastinating might give you some clues to help you figure out why you’ve developed that pattern (and also how to help yourself to reverse that pattern.) I hope you can find a method that will work well for you! I never linked procrastination and perfection together yet they both describe me to a tee ! None of my friends understand this, but they don’t have either of these attributes. I will give this a try and maybe get the book also. Yes…this sounds like me…and my boyfriend. I’m going to try this tip. I’m hoping that he’ll see it working for me and try it himself. I’ll be positive and buy 2 timers. So glad I saw this pin. Thank you. I really do believe it will help me.